Although Joe Chemo may seem like a joke, there's nothing funny about chemotherapy. This web site is dedicated to chemo patients and their family members, with the hope that it will reduce the number of people who smoke and need chemotherapy (see Site Credits and Awards for further details on the web site). 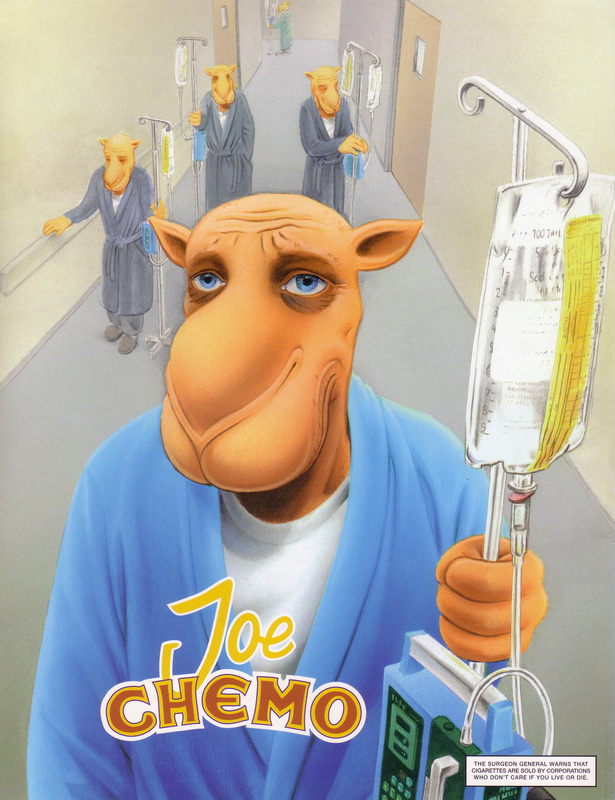 Joe Chemo was developed as an antismoking character by Scott Plous, a Wesleyan University psychology professor, after his father nearly died from smoking. The idea was to present a more honest image of smoking than the Joe Camel character used by R. J. Reynolds. 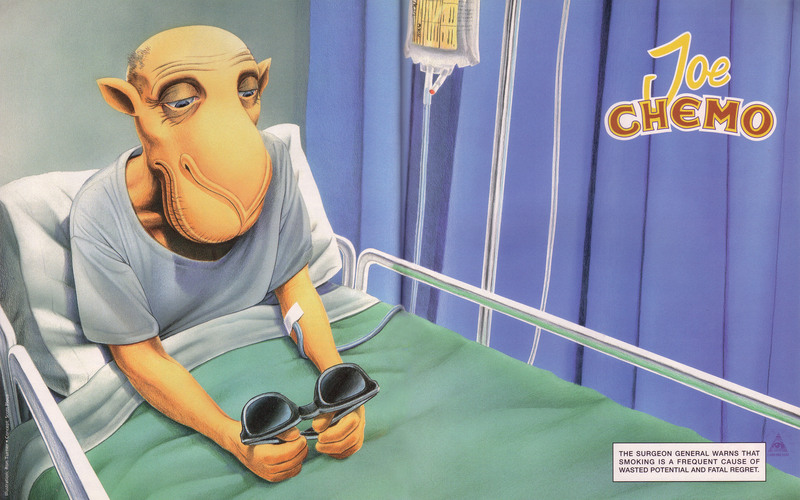 The first image of Joe Chemo ran in the Winter, 1996, issue of Adbusters magazine. Since that time, Joe Chemo has appeared in or been mentioned by the New York Times, the Associated Press, Time magazine, the Wall Street Journal, Newsweek, the Washington Post, the Los Angeles Times, PBS, Business Week, AdWeek, ABC and NBC television news, and many other media outlets. 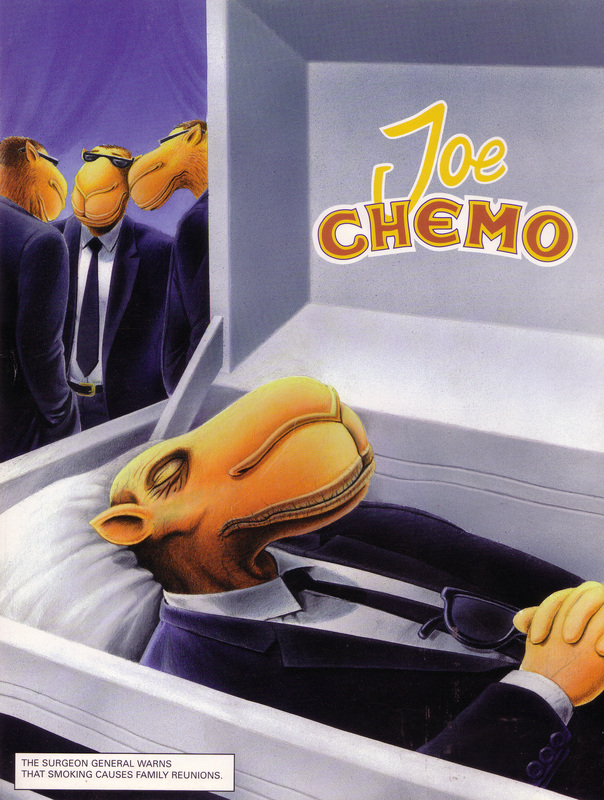 In addition, the Washington State Department of Health has distributed 10,000 Joe Chemo posters to public schools, the National Council on Alcohol and Drug Abuse in Colorado has given away hundreds of Joe Chemo t-shirts, and Joe Chemo has appeared on billboards in several cities. For information on posters, billboards, and other materials, please email or call Adbusters at 604-736-9401 (bulk discounts available). During the first three years of Joe Camel advertisements, Camel's share of the under-18 cigarette market jumped from 0.5% to 32.8%, representing a $470 million increase in annual sales for RJR Nabisco. DiFranza, J. R., Richards, J. W., Jr., Paulman, P. M., Wolf-Gillespie, N., Fletcher, C., Jaffe, R. D., & Murray, D. (1991). RJR Nabisco's cartoon camel promotes Camel cigarettes to children. JAMA, 266, 3149-3153. More than 90% of six-year-olds matched Joe Camel with a picture of a cigarette, making him as well-known as Mickey Mouse (by comparison, only 67% of adults recognize Joe Camel). Fischer, P. M., Schwartz, M. P., Richards, J. W., Goldstein, A. O., & Rojas, T. H. (1991). Brand logo recognition by children aged 3 to 6 years: Mickey Mouse and Old Joe the Camel. JAMA, 3145-3148. On May 28, 1997, the U.S. Federal Trade Commission charged that the Joe Camel advertising campaign violated federal fair trade practice laws by promoting a lethal and addictive product to children and adolescents under the age of 18. Broder, J. M. (May 29, 1997). F.T.C. charges "Joe Camel" ad illegally takes aim at minors. New York Times, pp. A1, B10. On July 10, 1997, RJ Reynolds Tobacco Company announced that its 23-year-old Joe Camel advertising campaign would be discontinued. Elliott, S. (July 11, 1997). Joe Camel, a giant in tobacco marketing, is dead at 23. New York Times, pp. D1, D4. To read more about the life of Joe Chemo, including reminisces from his childhood friends, please see the Biography of Joe Chemo. You are also welcome to use these high-resolution images for nonprofit educational purposes as long as you cite the source as JoeChemo.org and Adbusters magazine.